A global ICT (Information and Communication Technology) infrastructure and smart devices provider faced difficulties in finding the right piece of information in their enormous repository of instruction manuals. Their employees were wasting a lot of time reading through the full-text of these documents to find specific details. This led to delays in service delivery which had a disastrous impact on customer satisfaction and the company’s brand value. The company desired a solution that would enable its employees to quickly retrieve specific information from the documents. Softweb Solutions developed an efficient document search system using natural language processing. This system understands the user’s intent and then offers a crisp and accurate response. 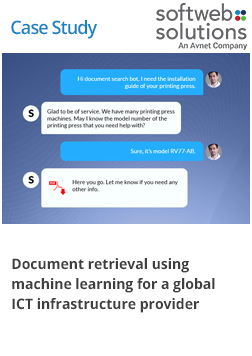 We also developed a chatbot so as to provide an interactive search experience for the employees and better accessing of the product-related documents.